Put oats, 2 tablespoons of the chia seeds, 3 cups of the milk and the dates in a sealed container in the fridge over night. Dry fry walnuts, pistachios and almonds in a large frying pan, over a medium heat for 2-3 minutes. Add honey and cook a further 3-4 minutes until lightly toasted and glazed with honey. Stir occasionally so that the nuts don’t catch and burn. 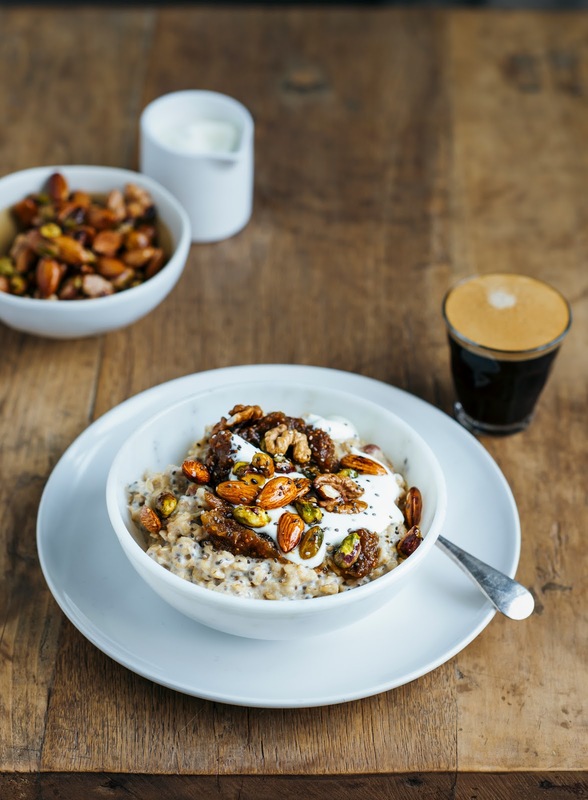 Although toasted the nuts remain a little sticky, so store in an even layer until ready to spoon over porridge. To cook porridge, bring the oat mixture to a gentle boil, reduce the heat to a simmer, and cook, stirring for 8-10 minutes until thickened. Add extra milk to achieve your desired consistency. Remove from the heat and serve immediately with a dollop of date and fig puree, a spoonful or two of yoghurt and a sprinkling of nuts. For garnish, sprinkle with the extra chia seeds if desired. 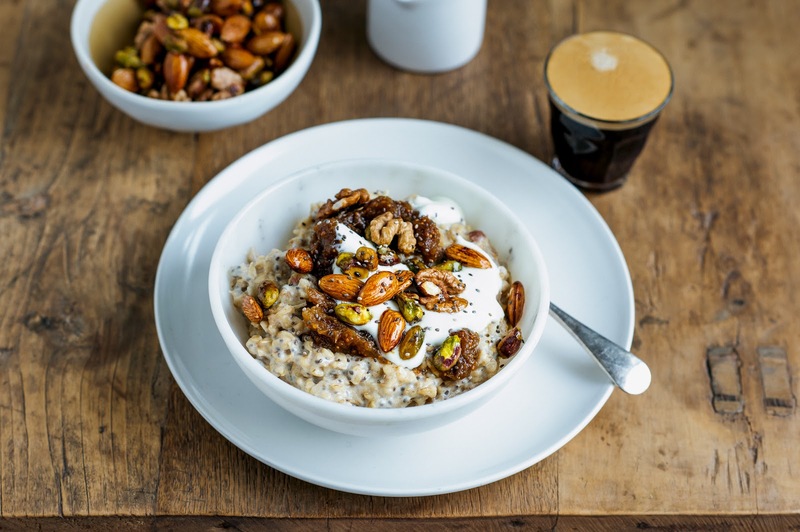 I find porridge serving sizes vary wildly – and while this would happily serve four of me, I know some men would demolish half of it, so use your judgement with regard to servings! Put all of the ingredients in a small pot with ¾ cup water and bring to a gentle boil. Reduce the heat to a simmer and cook, stirring, for 5 minutes then remove from the heat. Leave to cool for 5 minutes before mashing to a paste with a fork – or for a smoother consistency blend in a small food processor. For a thinner consistency simply add ¼ cup more water. Cool and store in a covered container in the fridge until ready to use. This looks like the perfect way to begin the day!! Definitely need to try!